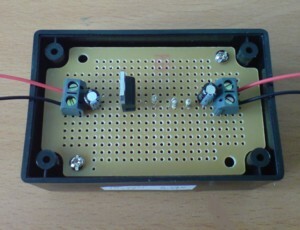 Buy of 9V FROM 12V SOURCE. As we covered in our article High Capacity Alternative to 9 Volt Batteries, the capacity of 9 Volt batteries is very low. Therefore, when used to power wireless CCTV cameras etc., the battery needs changing every few hours! This circuit will take in input voltage of 11-30 Volts DC and provide a regulated output voltage of up to 1 Amp at 8.5 Volts giving an alternative to expensive 9V batteries. This 8.5 Volt regulated DC supply is perfect for use with wireless CCTV and other devices powered by a 9 Volt Battery (not including smoke alarms). This power supply will provide a regulated (fixed) output of 8.5 Volts from an input voltage of 11+ Volts. It can therefore be powered directly from a solar panel or a 12 Volt car or leisure battery giving an enormous increase in battery life. The power supply is built around the LM317T voltage regulator (pictured above). 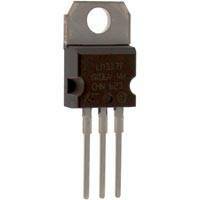 Its use is described in our article Using the LM317T to Regulate Voltage. Why 8.5 Volts and not 9 Volts? – Devices powered by 9 Volt batteries do not typically require 9 Volts to operate optimally. 9 Volts is at the very upper end of the actual operational voltage range of around 7-9 Volts of most devices. If you prefer a DC supply of exactly 9 Volts (or any other voltage for that matter), please contact us directly with details of your requirements. NEW – Where a voltage regulator is required to replace a (nominally) 9V battery, but the available input voltage supply is likely to fall below 11 Volts – e.g. if you are using a battery pack of 8 AA batteries (see article High Capacity Alternative to 9 Volt Battery) – then click here to find out about LM2941: a low dropout alternative to LM317 which can be made to make a suitable voltage regulator circuit. The LM317T used in this circuit does not include a heatsink. As the LM317T brings the input voltage down to the required 8.5 Volts some heat is dissipated – however, 9 Volt battery (PP3) powered devices typically draw a current of no more than 200 milliamps rendering a heatsink unnecessary. If you intend to use this regulated 8.5 Volt power source to power devices drawing in excess of 500mA of current, or from a 24+ Volt input voltage, please contact us directly with details of your exact requirements so we can put together a circuit for you with the correct level of heatsinking. If the current draw is likely to be over 1 Amp we can also use a (slightly more expensive) LM338T voltage regulator rather than the LM317T in the circuit.